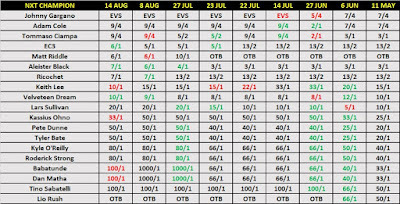 With NXT TakeOver: New York taking place tonight, I decided to take a look back at a betting market from Kambi that I last saw available on the night before SummerSlam 2018. This was a special in which customers could place bets on who they thought would be holding the NXT Championship at the end of this coming weekend. 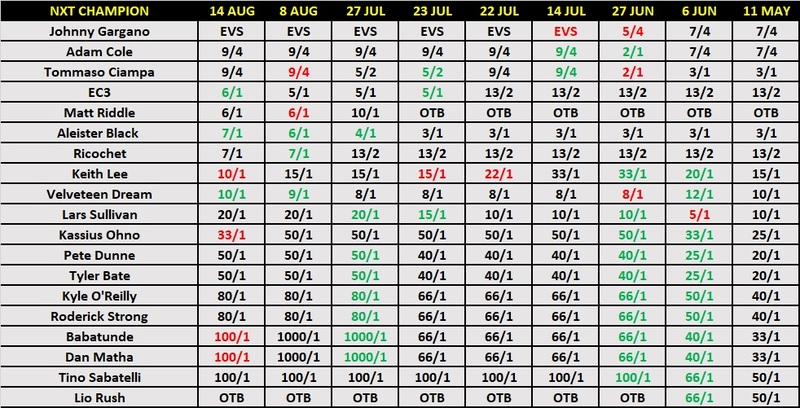 As I said, this market was last available on August 18th, which was the day of NXT TakeOver: Brooklyn IV. At the time, Tomasso Ciampa was set to defend the title against Johnny Gargano. He went on to retain. The closing favourite to leave WrestleMania weekend was Gargano. Right next to him in second-favourite are Ciampa and Gargano's opponent for tonight - Adam Cole. It's interesting to me because, had Ciampa not had his injury when he did, Gargano would - in my opinion - for sure left WrestleMania weekend with the strap. Instead, the person who was tied with Ciampa in the betting during August, Adam Cole, might be the guy after tonight. Gargano's best price would have been the 7/4 that was on offer from May 11th before he started to lower around late-June. As for Cole - his best price was his closing number of 9/4. He had drifted out to this level in mid-July. Cole is the bookies' favourite to win the best-of-three falls match for the vacant title at websites like Paddy Power/Betfair. Sky Bet and those with Kambi's markets.